Here we are, at the end of yet another year. How does time pass so quickly? I'm sure you've seen a couple 2014 wrap-up articles, as well as a couple 2015 prediction articles. Really, you can't make it to the new year without seeing at least several of these kinds of things, right? So, naturally, I decided to take a crack at my own prediction for 2015. Without any further ado, here it is: Web content strategy will shift slightly from the "content is king, let's just publish as much good content as humanly possible" method to "personalized, interactive content is king." 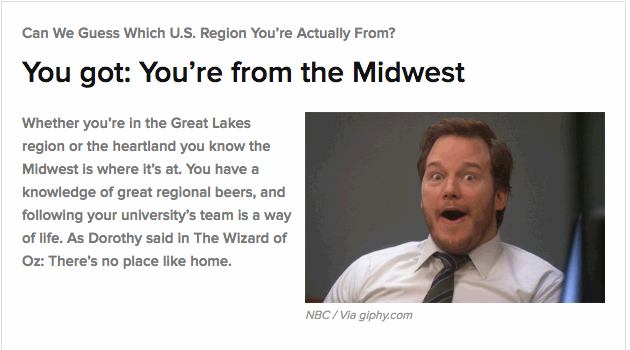 I'm going to go ahead and call 2014 "the year of the quiz." If you were anywhere near a Facebook feed or buzzfeed.com, you were subject to many, many time-waster quizzes that promise to stroke your ego, teach you something about yourself, or prove how much you know (or don't know) about a specific topic. You may have seen your friends' results, obnoxiously hanging out in your feed. With titles like "Which Disney princess are you? ", "Which of Taylor Swift's cats are you? 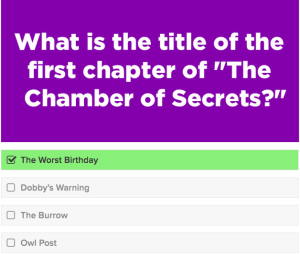 ", and "The Hardest Harry Potter Quiz You'll Ever Take," these things were all over the place in 2014, and they were ridiculously successful. Why do these quizzes work as addicting, sharable content? Answer: Their (ingenious?) 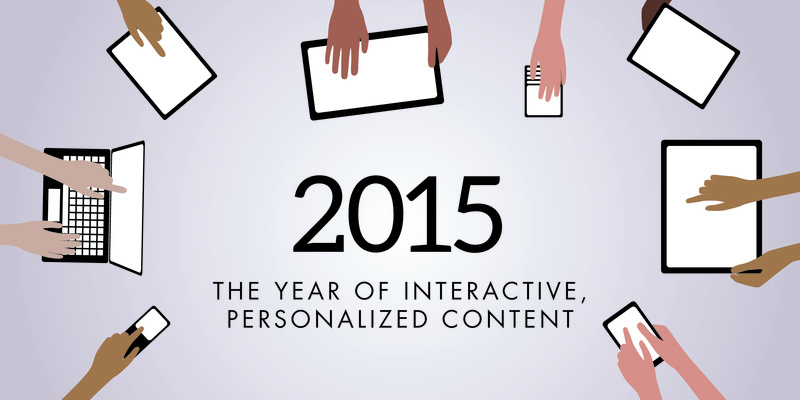 use of interactive, personalized content. 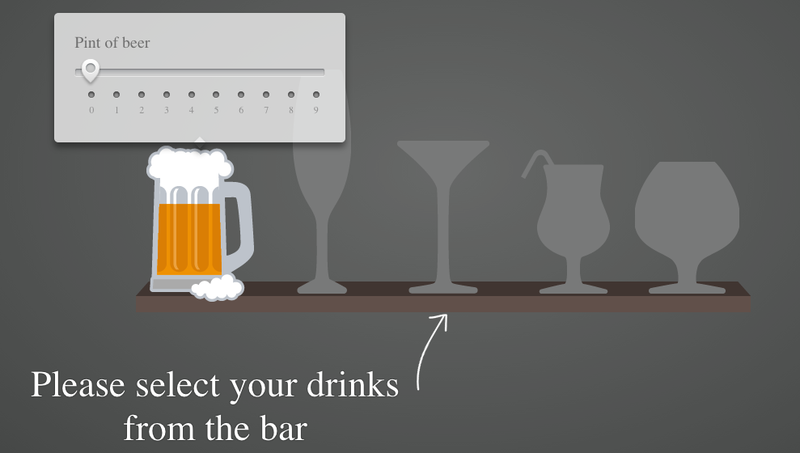 The quizzes are made to give you, the user, a personalized experience. Your score or outcome will most likely differ from your friends', giving you a unique experience. So, since you probably won't be posting a bunch of Buzzfeed-style quizzes on your business's website, how do you take advantage of content personalization? Content related to other custom user data you've gathered, such as job/position title, age, etc. Content related to data you can gather on your own, such as a user's geographical location, operating system, browser, visitor type (new vs. returning), mobile device, etc. Creating personalized content usually requires more of your time, energy and budget to produce and manage. However, the payoffs can be massive. A personalized user experience can create major opportunities for increasing your ROI. Instant gratification has become something many web users expect in a variety of situations. They want to be an active website visitor, rather than a passive one. They want to scroll, swipe, click, play and download. When taking a Buzzfeed quiz, a user knows instantly if he or she has chosen a right answer or a wrong one, and gets an instant overall score and explanation of that score. Like personalized content, creating interactive content will take more of your time and budget, but can also carry major payoff. There are a lot more options for types of interactive content that you can use on your website, from the simple (Buzzfeed quiz) to the advanced. Apps - The sky's the limit! Interactive and personalized content are both excellent ways to increase your ROI and improve your user experience in 2015. However, they do require more than the usual amount of content planning and strategizing time. It's important plan accordingly, so that your hard work will pay off. Oftentimes, integrating exciting new personalized and/or interactive content goes hand-in-hand with a website redesign, if that's something you've been considering. Interested in chatting about personalized or interactive content for your website? Get in touch.